All the news you need to know from the E3 2018 Nintendo Direct! With three days of press conferences behind us, Nintendo stands alone on Day Four, bringing us a Nintendo Direct event that was a brilliant gift for Switch owners! First-party announcements are the best way to kick off an event, and Nintendo did that in style with Armored Core producer Kenichiro Tsukuda’s latest mech-fighting offering. Based on the short trailer, Daemon X Machina is colourful, it’s fast-paced, it’s customisable and it’s full of explosions — everything we want in our unadulterated robot destruction! Marvelous Games expects to release the title at some point next year; no word yet on whether it’s coming to other platforms. Super Smash Bros. is finally coming to Switch, and everyone’s going to be there! Yes, everyone. 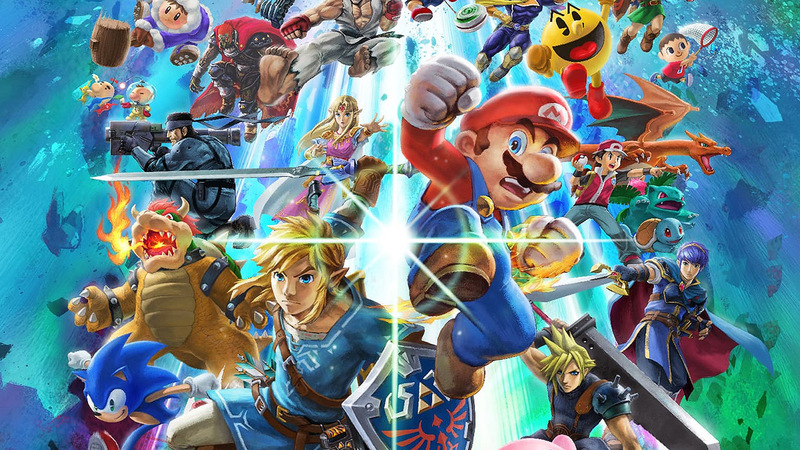 From Mario through to the series’ most recent entrant, Bayonetta, “everyone is here.” That includes fighters added through paid DLC, such as Final Fantasy VII’s Cloud Strife and Street Fighter stalwart Ryu, and characters who’ve previously been cut from the series like Pichu, Young Link and the Ice Climbers. Literally. Every. Fighter. There are also some new fighters, including the Inkling Boy and Girl from Splatoon and Samus Aran’s big, scary mofo of a nemesis Ridley. They won’t all be available out of the box, but Nintendo has promised to make them easier to unlock than they were in previous titles. The game will also bring back 8-player battles, which are sure to be fun, and has a number of updates to each character based on player feedback and developments within their home series. It’s set to launch on December 7 — only a few short months away! Slated for October 5, the first Mario Party on consoles since 2015’s Mario Party 10 takes fantastic advantage of the Switch’s unique features by allowing players to play with multiple Switch consoles linked together; characters will actually move between consoles, regardless of how they’re laid out, which makes for some variable gameplay. Among the new characters coming to Super Mario Party, we were able to spot Dry Bones, Rosalina and a Goomba. The first Switch entry into the much-loved series, Fire Emblem: Three Houses, looks set to bring a whole new level of depth to its gameplay by allowing players to command large groups in order to unleash more powerful attacks — the obvious trade-off being that you’ll also fight enemies in large groups. The biggest change to the series’ formula, however, comes in the form of a fully-rendered, living world as opposed to the more static look of entries past. Fire Emblem: Three Houses is set to release in Autumn 2019. The world’s biggest video game has finally made its way into Nintendo’s fortress, and you can play it with your friends on other consoles with one caveat: if you’ve played the game on PlayStation, you won’t be able to log into your account on your Switch. We’re not sure why Sony has decided to block cross-platform play with the Switch, but we’ll let you know if we find out… Or if it changes. Xenoblade Chronicles 2’s next expansion is called Torna — The Golden Country; it’s set 500 years before the game’s events, it includes a refined battle system, and it’s slated for September 21! Overcooked 2 is on the way, and it’s got online multiplayer! Team 17’s latest cooking game is headed to Switch, PlayStation 4, Windows PC and Xbox One on August 7. Bandai Namco Entertainment is bringing the fantastic Dragon Ball FighterZ to Switch at some point later this year! Announced at the “Nindies” stream in March, the Kickstarted (and very well-received) Hollow Knight is now available on Switch, and its $15 price tag gets you all four of the free expansions Team Cherry has released for it as well! The unique arcade title Killer Queen is making its way to Switch as Killer Queen Black, offering four-versus-four play and the same 2D action that was found in the original. It’s slated for release in the first quarter of 2019, with a Windows PC release to follow.